The people Time Clock Plus has been working with for over three decades care about paying their people on time, accurately, and without any problems that slow the business down, create problems for HR, or increase organizational costs. They know the complexity of their businesses requires a sophisticated solution, and they won’t settle for anything less. Because they want time and attendance done right. That’s who we work long nights for. As WFM solutions have evolved, we’ve evolved with them based on the needs of our customers. 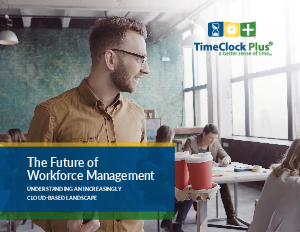 TimeClock Plus v7 with Advanced Scheduler, Leave Management, SubSearch Plus, and Advanced Labor Costing are changing the way organizations enable their people — and that’s just the beginning! We know that whether it’s in payroll, HR, finance, or the C-suite, you are looking for time and attendance software that delivers accuracy. You need to be able to trust your time and attendance software to provide your company the accurate data it needs to process payroll correctly and efficiently, maintain compliance with wage and labor laws, manage costs, and manage the workforce properly.